What Would You Do If Putin Cut Your Heat Amid Extreme Temperatures? Extreme weather, merciless cold in the Midwest United States, snow squalls bringing near-whiteout conditions to the Northeast, nine dead, schools and postal service in many states canceled, and airports closed — an "act of God" as they say, yet MSNBC's Rachel Maddow still found a way to make it all about Putin. She breathlessly reported Wednesday evening that life-threatening cold weather in the US could be weaponized by Russia. 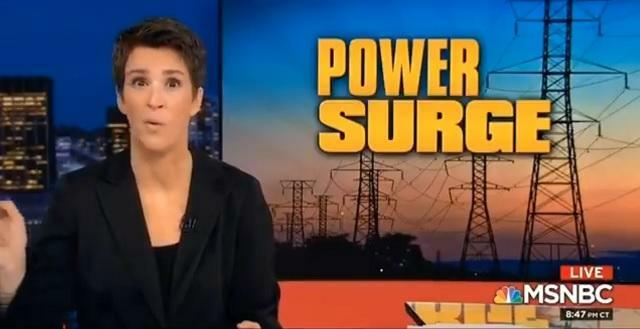 Maddow invoked a recent intelligence assessment which speculated over Russia and China's abilities to launch cyber-attacks on critical US infrastructure, including natural gas pipelines. Running with this "what if" scenario, she launched into her now well-known conspiracy theorizing and fear-mongering, saying "It is life-threatening! And it is like negative 50 degrees in the Dakotas right now." We're relying on their [Russia and China's] good graces that they're not [attacking us]. It is life-threatening. And it is like negative 50 degrees in the Dakotas right now. What would happen if Russia killed the power in Fargo? What would happen if all the natural gas lines that service Sioux Falls just poofed on the coldest day in recent memory and it wasn't in our power whether to turn them back on? What would you do if you lost heat indefinitely as the act of a foreign power? ...On the same day the temperature in your backyard matched the temperature in Antarctica... What would you and your family do? This was enough for journalist Glenn Greenwald to request that the network scrub the absurdly embarrassing segment from the internet altogether. "I'm not even joking. I have so much work to do and I can't stop watching this," he said. "MSNBC often removes its most embarrassing debacles from the internet. Someone please do that here so I can get to work." He followed by posing a serious question for liberal media in 2019: "For anyone who prides themselves on being a rational, fact-based person who shuns fear-mongering and unhinged conspiracies, please answer honestly - I'm genuinely interested in your answer: do you feel any embarrassment at all while you watch this???" Sadly we expect the answer to by and large be "no" — but at least this will bring more future hours of news coverage unhinged-conspiracy-fearmongering-as-entertainment TV watching. Sergey Lavrov just hacked my boiler and unplugged my refrigerator. However, as independent journalist Aaron Maté points out, this is also serious business given the way Maddow is manipulating a truly dangerous extreme weather situation. "I generally argue that Russiagate conspiracy and fear-mongering distracts us from serious issues," Maté said. He concluded, "This is a good example of Russiagate peddlers like Maddow not ignoring, but using serious issues like life-threatening cold weather for conspiracy and fear-mongering."